Social Democrat co-leader Catherine Murphy and Sinn Féin’s Pearse Doherty TD on the plinth of Leinster House following yesterday’s Supreme Court victory. Further to Denis O’Brien’s loss in the Supreme Court yesterday. ‘Mr O’Brien was looking to assert what he saw as his rights as a citizen in a democracy. His action was based on asserting a principle. The 19 individuals [who had their private data removed from email servers in Independent News And Media and taken to the Isle of Man where the data was “interrogated” and costs covered by a company controlled by Mr O’Brien, Blaydon Ltd,] all of whom are undoubtedly people of high principle, will more likely be interested in receiving monetary compensation rather than a legal declaration. If they can prove their case, they will be entitled to be well-compensated for a breach of their privacy. In such an eventuality, the money will have to be paid out by INM. The first in a bowel-loosening series of emails from Denis O’Brien’s solicitors after the posting of Ms Murphy’s speech in the Dáil, May 26, 2015. Posted in Misc and tagged Catherine Murphy, Denis O'Brien, Pearse Doherty at 1:45 pm on March 6, 2019 by Bodger. This afternoon in the Dáil. 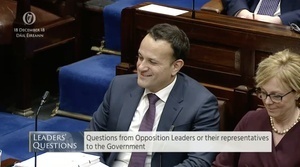 Taoiseach Leo Varadkar was responding to comments made by Sinn Féin TD Pearse Doherty about the recent eviction and subsequent events at a farmhouse near Strokestown, Co Roscommon. He said the High Court doesn’t issue eviction orders lightly, and said 116,000 mortgages have been restructured while “only” 400 eviction orders were executed in the last year. “No family, regardless of their circumstances, and it’s not the Revenue that are evicting them, regardless of their circumstances, should have been treated in this way. This idea that banks enforcers, these thugs, and I call them thugs, can enter into somebody’s property, can cut down locks, break down doors, can take somebody out by their ears, can kick somebody on the ground and push them out of their own home and property, while the guards watch on, is not acceptable. “And we have raised this with you countless times and it is not just bank enforcers that are unregulated, we have rent receivers that is unregulated. Why are they doing this? And why is the public so outraged? And I commend the public for standing up in solidarity with the family and people who are facing eviction. “And standing against the type of thuggish behaviour that we’ve seen last Tuesday. Why are they doing this? Because your government has completely abandoned these communities. You have rolled out the red carpet for the vulture funds, you’re allowing thousands of sales of restructured performing mortgages to take place of the vulture funds outside of the code of conduct of the Central Bank. Mr Varadkar told Mr Doherty that he was “very concerned” that Mr Doherty “had nothing to say about what happened afterwards” – referring to events at the property on early Sunday morning. At this point Mr Doherty started to respond to Mr Varadkar and the Leas Ceann Comhairle Pat “The Cope” Gallagher called for order. The call for order went on for more than 30 seconds. “Deputy, I condemn violence and thuggish behaviour by anyone, under any circumstances, so let there be no doubt about this. But in two contributions, in fact, in three contributions now, you have dismissed the fact that tax evasion is a serious offence. Mr Gallagher began to call for order again. Posted in Misc and tagged balaclava, Leo Varadkar, Pearse Doherty, Roscommon at 2:54 pm on December 18, 2018 by Bodger. 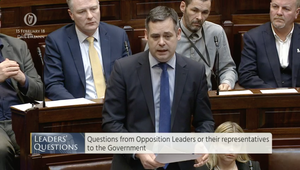 The train has left the station says @PearseDoherty ..
During Leaders’ Questions, taken by Minister for Health Simon Harris. 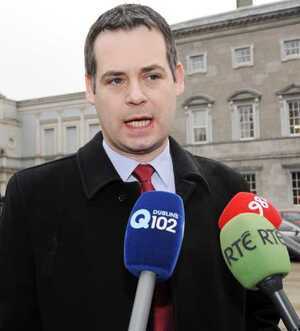 Sinn Fein TD Pearse Doherty raised the Permanent TSB sale of €3.7 billion worth of residential mortgage loans. 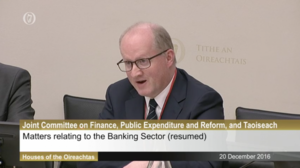 Mr Doherty said the bank has been invited to attend the Oireachtas finance committee next Tuesday. Mr Harris said the bank should go before the committee and said it would be good to see some “humility” from the bank. 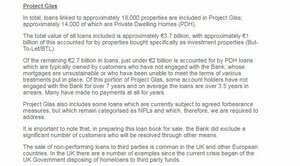 Is PTSB deliberately giving the impression that most of the 14,000 owner-occupier mortgages being sold are in arrears for “years”? Posted in Misc and tagged Pearse Doherty, Permanent TSB, Vulture funds at 1:19 pm on February 22, 2018 by Bodger. “We have made it clear to the British government, in the right and appropriate way, that a move to direct rule is not where we want to be “- says the same is true of UK, and probably of the DUP. Wants to get talks back going again. Posted in Misc and tagged Dail, DUP, Northern Ireland, Pearse Doherty at 1:12 pm on February 15, 2018 by Bodger. The High Court has ruled that businessman Denis O’Brien should pay all the costs of his failed action over statements made by two TDs in the Dáil about his banking affairs. 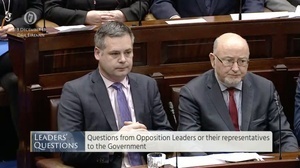 Mr O’Brien took his case against the Clerk of the Dáil and the State over comments made by Social Democrats TD Catherine Murphy and Sinn Féin’s Pearse Doherty in the Dáil in 2015. He wanted the court to reprimand the TDs and he claimed they had interfered with a court case he was taking against RTÉ. …This morning, the judge [Ms Justice Úna Ní Raifeartaigh] ruled that the facts of the case were unusual and had some degree of novelty as well as being of some public importance. …But she ruled there was “an insufficient degree of novelty” to cause her to depart from the normal rule where the losing party pays the costs of a case. Posted in Misc and tagged Catherine Murphy, Costs, Denis O'Brien, failed action, Pearse Doherty at 12:22 pm on May 2, 2017 by Broadsheet. The Dáil debated Sinn Féin’s motion of no confidence in Garda Commissioner Nóirín O’Sullivan. 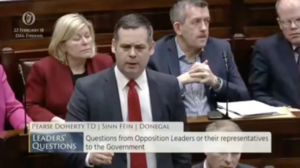 During the debate, Sinn Féin’s Pearse Doherty spoke about another Donegal Garda whistleblower Kieran Jackson, who is now retired. “There are many reasons why Nóirín O’Sullivan should leave her position as Garda Commissioner and there are many Members in the House who have outlined those reasons. I support the motion, obviously, that Sinn Féin has tabled. I will recall for the Minister of State, Deputy Stanton, the case of a former garda in the Donegal division, with whom I have engaged over the past number of years and who has engaged with the Garda Commissioner over that period. In May 2001, a former garda in the Donegal division met two detective inspectors from the Garda Bureau of Fraud Investigation in a hotel in County Monaghan. Accompanied by a witness, the detectives had invited the officer to meet them. During this exchange, the now retired garda disclosed to the interviewing detectives a number of very serious allegations against a former Garda superintendent, since retired, who was also stationed in Donegal. These allegations related to suspected tax evasion, social welfare fraud and persons being in possession of a fraudulent bank account into which thousands of pounds were being lodged regularly. This meeting in Monaghan lasted for over five and a half hours. As the meeting drew to a close, the detectives stated that they would be in contact again with the whistleblower shortly in order to take a written statement. However, this did not happen. In September 2014, a solicitor acting on behalf of the whistleblower wrote to then acting Garda Commissioner, Noirín O’Sullivan, in which he divulged all of the allegations of criminal wrongdoing suspected of having been committed by the whistleblower’s former colleague. The letter also expressed his client’s alarm at the apparent lack of any follow-up having been carried out on the part of the investigating gardaí. A similar letter, dated 24 September 2014, was subsequently sent to the Minister for Justice and Equality, Deputy Fitzgerald, around which time the whistleblower himself contacted me to request that I bring the case to the Minister’s attention, which I did. On 16 December 2015, the Minister replied to me in a letter in which she stated that inquiries were being made with the Garda Commissioner regarding the whistleblower’s complaint. A further letter, issued in May 2016, declared that inquiries into the claims were ongoing. Then, last September, the whistleblower finally received the news that he had long suspected. The Garda advised him that, following an extensive search of files and records held locally and at Monaghan Garda station, no record of his complaint or of any subsequent investigation could be found. The correspondence went on to say that inquiries made with the Garda Bureau of Fraud Investigation revealed that no investigation was ever carried out by personnel in respect of the whistleblower’s allegations. The whistleblower to whom I refer is former Garda Kieran Jackson. His story leads us to one of two conclusions. First, either Kieran Jackson is lying – I have no reason to believe that he is and there are other former gardaí who will corroborate his story – and no meeting between him and the detectives ever took place. The other conclusion is that somebody in An Garda Síochána has gone out of his or her way to cover it up and to ensure that his claims never saw the light of day. If the latter conclusion is the case, then questions need to be asked as to who took the decision? Kieran Jackson informs me that a failure to follow up or investigate a criminal incident is, in itself, a crime. Questions must be asked about who took the decision to not pursue his complaint. Why has Garda Commissioner Nóirín O’Sullivan – who has known about this for over two and a half years – done nothing about it? The Tánaiste and Minister for Justice and Equality, Deputy Fitzgerald, and her Government say that they have full confidence in the Garda Commissioner. Try telling that to Garda whistleblowers across the State. Try telling that to Kieran Jackson who has had no response from the Commissioner in respect of the allegations he brought forward many years ago, and again in 2014, to the Garda Commissioner and to the Minister, with absolutely no action whatsoever taken. Posted in Misc and tagged Alan Kelly, no confidence motion, Noirin O'Sullivan, Pearse Doherty at 9:36 am on April 13, 2017 by Broadsheet. It emerges at Oireachtas finance committee that, in fact, around 15,000 people will have been affected by Tracker scandal. Not 8,200. 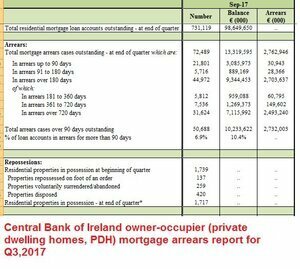 Posted in Misc and tagged banks, Committee on Finance, overcharging, Pearse Doherty, Philip Lane, Public Expenditure and Reform, Tracker mortgages at 12:44 pm on December 20, 2016 by Broadsheet. 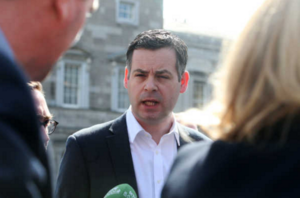 Sinn Féin TD and finance spokesman Pearse Doherty and Stephen Collins, political editor of The Irish Times, spoke on Today with Seán O’Rourke about the development. 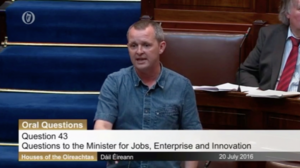 Anti-Austerity Alliance-People Before Profit TD Richard Boyd Barrett raised the €280million bill after he asked why the Government recently opposed an EU proposal to begin country-by-country reporting of corporation tax by large multinational firms. He was speaking during a debate on corporation tax. Richard Boyd Barrett: “A few weeks ago, the Government opposed an EU proposal to introduce public country-by- country reporting of corporation tax for large multinational companies on the spurious grounds of subsidiarity. Are we going to bring in public country-by-country reporting ourselves? Mitchell O’Connor: I reject tax avoidance. We cannot do it on our own. If we were to publish the figures the Deputy is referring to, it would allow some companies to gain a possible commercial advantage over others because matters would be deemed to be commercially sensitive. Other jurisdictions might not share the information with us if they knew we were going to publish the reports. It would not help the tax transparency agenda and a system of country-by-country reporting. I cannot do it. Posted in Misc and tagged Corporation Tax, GDP, Pearse Doherty, Richard Boyd-Barrett at 11:08 am on July 21, 2016 by Broadsheet. 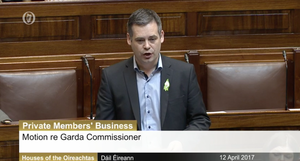 When I met with the Minister yesterday I highlighted that my main concern would be that the investigation does not end on Prom [Promissory note] night and that it extends into the time when the IBRC was in liquidation. There are many issues that straddle both time periods and it is vital that the investigation can properly follow these threads. For example, the purchaser of Siteserv, was already significantly indebted to IBRC. We know that on the 7th of March 2013 – one month post liquidation – that he wrote to the special liquidator seeking to reschedule his outstanding loans over a further 3 year period. We know that he claims to have been allowed a similar extension by virtue of a verbal agreement he claims he had with the CEO of IBRC (Mike Aynsley). We also know that, according to IBRC, the credit committee had never approved such a previous agreement yet Mr O’Brien maintains it was in place and he requested that the special liquidator be made to honour that verbal agreement. I wish the minister to clarify if the assertion of such a verbal agreement will be enough to satisfy the Terms of Reference regarding the ‘contractual obligations’ required in relation to investigating issues that straddle pre & post liquidation. We know that the credit committee met on the 23rd of May 2013 – two months after Mr O’Brien’s approach to the special liquidator and at that time the outstanding balance owed to IBRC by Mr O’Brien was in the region of €325million. It is worth, at this point, asking the question as to why someone, so heavily indebted, was allowed to make significant purchases from IBRC rather than being asked to pay down his outstanding loans. Were other bailed-out banks financing this buying exercise? Was he borrowing from Peter to pay Paul? Interestingly, an article that appeared in the UK edition of the Sunday Times in January 2012 showed that in 2011 & 2012 the IBRC refinanced some of Mr O’Brien’s loans and increased their security stake in some of his investments. It seems illogical that in the same time period they allowed him to purchase Siteserv for example. The point here is that some of the documents I am referring to relate to the Special Liquidators era hence the need for the period to be covered by the terms of reference. In recent days, The Chairman of IBRC (Mr Dukes) has made much of the fact that the Central Bank conducted a review, prior to July 2012, and apparently found no problems. 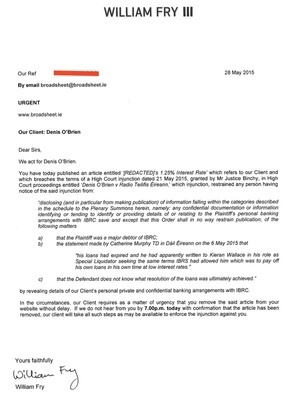 ….Yet It was not until I received an FOI of July 2012 internal Dept memos did we learn that the Department officials were expressing serious concern over the effectiveness of the CEO and the management team and they had serious concerns over the way a number of large transactions, including the Siteserv sale had been handled. ….Another significant issue that raised its head in some of the early reporting of this controversy but has since been replaced by other developments is the share activity in Siteserv prior to its sale. 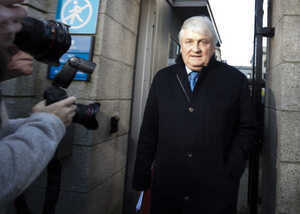 Various sources of information told me that the Siteserv share activity in November 2011 – the period during which the bidding process was underway – was irregular and that there had been a significant share spike around the time it was sold resulting in a nice windfall for some lucky investors. Unfortunately it was indicated to me that some of those investors may not have been so much lucky as they were well-informed. Indeed the Chairman of IBRC confirmed in an RTÉ interview that Denis O’Brien for example, had been given advance notice of the sale before it was announced. Did others have similar information? The unfortunate thing here is that while I know what insider trading is, I don’t yet know how we deal with it here in Ireland. On foot of my information regarding share activity, I wrote to the Irish Stock Exchange who advised me that it was not within their remit and that I should talk to the Central Bank. I wrote to the Central Bank who told me it was outside of their remit. I then wrote to the Office of the Director of Corporate Enforcement whose reply came back today to tell me that it does not appear to come within the remit of their office. 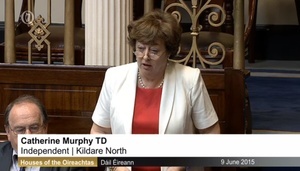 ….In my speech on May 28th I referred to loans held by Mr O’Brien that were due to be repaid in full in 2011 and 2012. We know they were not repaid in that timeframe. Effectively, once the agreed term expired, those loans were in default and became callable on demand. IBRC’s own terms and conditions allowed them to charge default interest rates yet they chose not to do so in this case. Many sources have come forward both before and since that speech, to say that they had personal experience of being both performing and non-performing borrowers of IBRC and their experience of their loans being called in, in a ruthless fashion and other defaulting borrowers talk of the punitive interest rates applied to them. …..The plight of the former Irish Nationwide Mortgage holders and the way in which they have been treated by IBRC compared to the very favourable environment that seems to have been provided to Mr O’Brien for example is perhaps an indication. Posted in Misc and tagged Catherine Murphy, Denis O'Brien, IBRC, Pearse Doherty, Siteserv at 7:53 pm on June 9, 2015 by Admin. Bumped into Pearse Doherty TD also in the corridor. A courteous hello was exchanged. Forgot to mention ‘unfounded and untrue’. Next time. 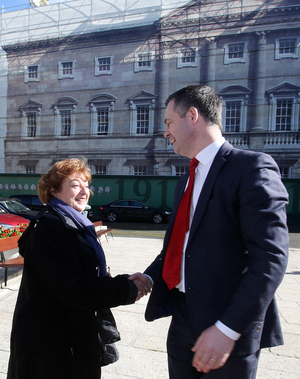 Maíria Cahill spent the day in Leinster House answering questions and talking about the wider issue of abuse. A Dáil debate is scheduled today from 2:30 pm regarding allegations of sexual abuse by members of the republican movement arising from the Maíria Cahill case. Posted in News, Politics and tagged abuse, Mairia Cahill, Pearse Doherty, Provisional Irish Republican Army, Republican Movement, Sinn Fein at 9:30 am on November 12, 2014 by Admin.